BERLIN: Venezuelan opposition leader Juan Guaido called on Europe Thursday to intensify financial sanctions against the regime of Nicolas Maduro, a day after Caracas expelled the German ambassador for “interference”, reports AFP. European countries “should strengthen financial sanctions against the regime. The international community must prevent Venezuelan money from being misused to kill opponents of the regime and indigenous peoples,” Guaido said in an interview with the German news weekly Der Spiegel. 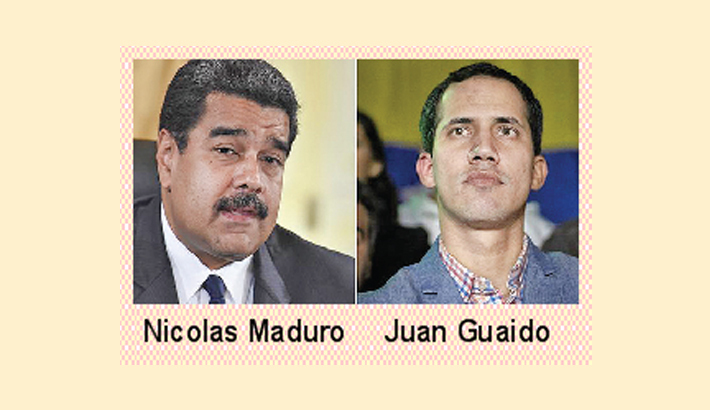 Guaido, who declared himself interim president in January, strongly condemned the decision by President Maduro to expel the German ambassador to Caracas, and urged the envoy to “remain” in Venezuela. “Venezuela lives under a dictatorship, and this way of proceeding is a threat to Germany,” Guaido said. “Maduro holds the presidency illegally. It is not legitimate to declare an ambassador undesirable,” he added, thanking Germany for humanitarian aid it has provided. Venezuela expelled Germany’s ambassador Wednesday, hitting out at international support for Guaido. The foreign ministry gave German envoy Daniel Kriener 48 hours to leave for “interference” in Venezuela’s internal affairs. Meanwhile, Venezuela expelled Germany’s ambassador Wednesday, hitting out at international support for opposition leader Juan Guaido as the US stepped up sanctions in a bid to force out his rival President Nicolas Maduro, reports AFP. Separately, an American journalist was detained by Venezuelan security services for some 12 hours and due to be deported, in an incident condemned by advocacy groups as an attack on free speech. The foreign ministry gave German envoy Daniel Kriener 48 hours to leave for “interference” in Venezuela’s internal affairs. He had greeted Guaido at Caracas airport on his return to the country on Monday.